Daytona, 26th January, IMSA WeatherTech Sportscar Championship 2019, Rolex 24 at Daytona, Daytona International Speedway, Daytona, FL (USA). Chaz Mostert (AUS), John Edwards (USA), Bobby Rahal (USA) Team Principal, Jens Marquardt (GER) BMW Motorsport Director, Alessandro Zanardi (ITA) BMW M8 GTE #24 and Colton Herta (USA), Augusto Farfus (BRA), Connor De Phillippi (USA) and Philipp Eng (AUT), BMW Team RLL picture. 08.02.2019 BMW works driver Alessandro Zanardi (ITA) attracted global attention with his start at the 24 Hours of Daytona (USA) in the BMW M8 GTE. The Italian was the focus of reporting all over the world and was the fans’ favourite at Daytona. 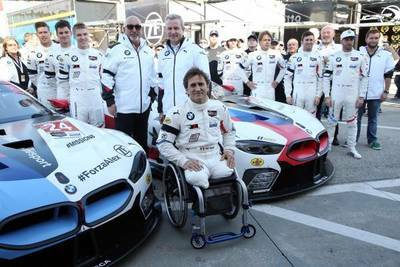 In an interview, Zanardi looks back at the “24 Hours of Daytona” project.</p>Munich. BMW works driver Alessandro Zanardi (ITA) attracted global attention with his start at the 24 Hours of Daytona (USA) in the BMW M8 GTE. The Italian was the focus of reporting all over the world and was the fans’ favourite at Daytona. Run by BMW Team RLL, the #24 BMW M8 GTE that Zanardi shared with John Edwards (USA), Jesse Krohn (FIN) and Chaz Mostert (AUS), had been modified with a special hand-operated braking system by BMW M Motorsport. After several minor set-backs in the race, the quartet came home ninth in the GTLM class. Victory went to the sister car, the #25 BMW M8 GTE, with Connor De Phillippi (USA), Augusto Farfus (BRA), Philipp Eng (AUT) and Colton Herta (USA) at the wheel. In an interview, Zanardi looks back at the “24 Hours of Daytona” project.